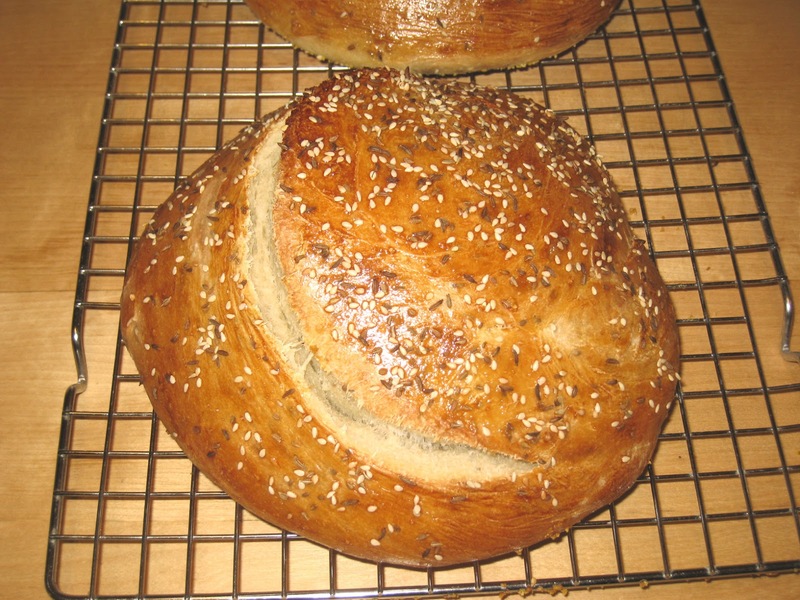 I ran across this recipe for Sephardic Challah when I was looking for challah recipes. I grew up with the sweetish, eggy Ashkenazi version and did not even know there was any other kind. So when I saw it I knew I had to make it. While I like a well-made Challah as much as the next person does, I must admit I was blown away with how good this version is. The spices complement each other perfectly and each bite is loaded with flavor, but it is not so much that it overpowers anything you spread onto it. While I am pretty good these days at rationing myself to one serving of bread a day (it's the only way I can justify making so much of it! ), I must confess that I scarfed up several days' worth of servings the first time I made it. It is easy to make and comes together quickly but the end result belies that simplicity. This bread is delicious and sure to impress. It makes fantastic toast and sandwiches for everyday use and will brighten up any occasion. I adapted the recipe to my usual sourdough. The original volume measurements are at the end of the ingredient list. Toast the sesame, caraway and anise seeds in a small skillet over moderate heat until fragrant, about two minutes. Transfer the seeds to a plate and let cool. Reserve 1 tablespoon of the mixture for topping the bread. In a large mixing bowl combine the starter with the water and mix well. Add the olive oil, the honey, all but the reserved tablespoon of the seed mixture and the salt and stir everything together. Add the flour, a cup at a time, until the dough has formed into a soft ball and remove it from the bowl onto a floured sourface. Knead the dough for about 10 minutes until it is supple and smooth, adding additional flour as needed. Transfer the dough into a greased bowl and cover with plastic. Let rise until the dough has doubled, about one hour. Turn out the dough onto a lightly floured surfce and deflate it. Cut it in half and let it rest for 5 minutes. Roll each piece into an 18-inch rope and let rest for 5 minutes. Roll each one into 32-inch ropes. Starting from the center, form each rope into a coil. Tuck the ends under the coils. Preheat the oven to 400°F. Whisk the egg yolks with 1 tablespoon of water in a small bowl. Brush the egg wash over the loaves and let stand uncovered for 30 minutes. Brush with the egg wash once more and sprinkle with the reserved tablespoon of seeds. Bake the loaves on the same shelf in the center of the oven for 30 about minutes, until they're golden and sound hollow when tapped on the bottom. Transfer to racks and let cool completely before slicing.